The TRT Training scheduled for Saturday, April 3, 2010 has been postponed indefinitely. An announcement will be made once the training is rescheduled. Stations 1, 9, 19 and 27 responded to a high speed single vehicle MVC on Cottageville Highway west of Round O Road at 2005, Monday evening 29-March. 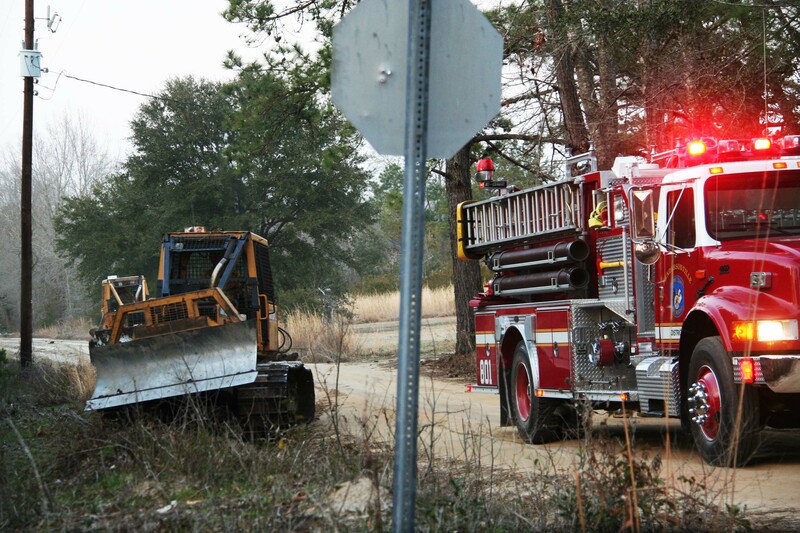 Engine 19 arrived to report a small SUV with heavy damage, on its side in a creek. 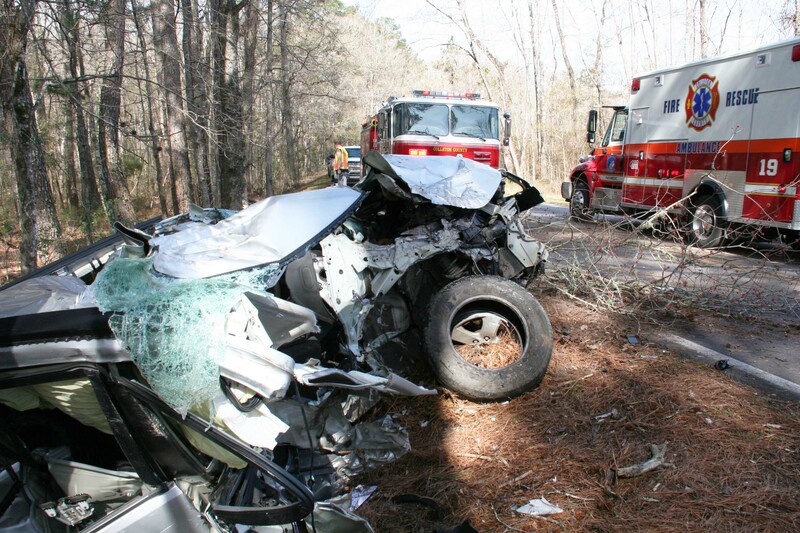 The only occupant received multiple traumatic injuries and was trapped in the wreckage. Click here for more information. 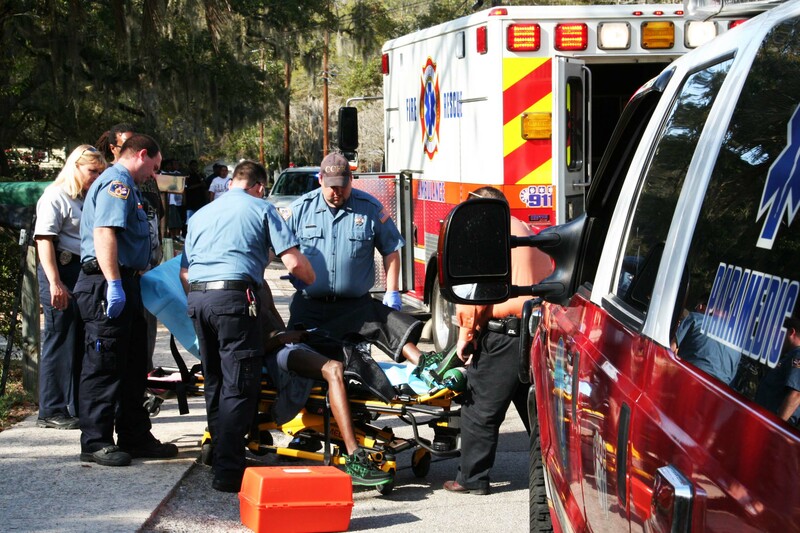 Medic 6 and Truck # 116 responded with Walterboro Public Safety Officers to a shooting incident in the 200 block of Rivers Street at 1650, Monday afternoon 29-March. A 19 year old male received a single GSW to the right leg. He was stable when Firefighter-Paramedics arrived. 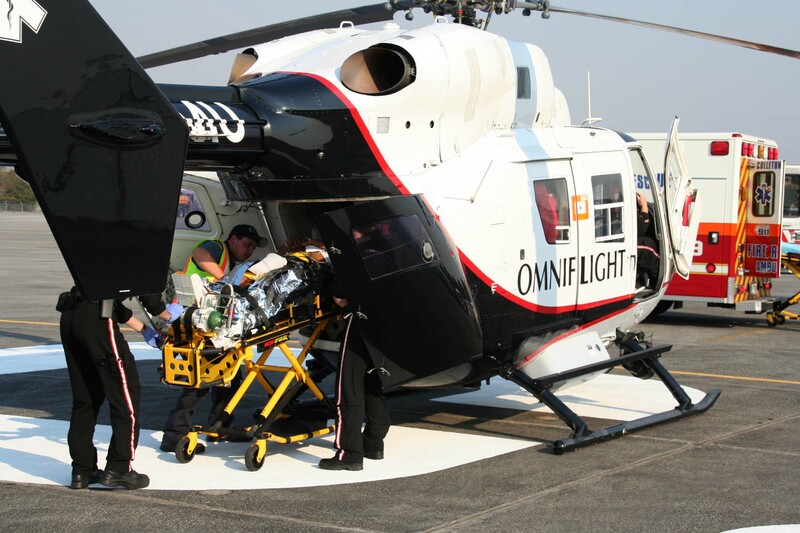 The crew bandaged his wound and started IV fluids... click here for more information. Stations 9, 19 and 26 responded to a two car MVC on Round O Road at the intersection of Freeman Lane at 10:49 AM Sunday morning 28-March. Three people were injured in the head-on collision when one car turned into the path of a southbound vehicle. Initial callers to 9-1-1 reported one person was trapped, however the first arriving unit found no one to be entrapped. Click here for more info. We have been informed that Cliff Parker has passed away. Cliff served as the Assistant EMS Director in Colleton County about 8 years ago. He left to accept a management position with Charleston County EMS and has served in that post since. For those who did not know him, he was really a great person. Click here for additional information. Stations 1 and 6 responded to a fast moving grass/woods fire in the 2100 block of Possum Corner Road at 1458, Saturday afternoon 27-March. Engine 1 initially responded to the report of a grass fire in this area, but arrived to find the fast moving fire which was endangering several structures at Pineland Plantation. Click here for additional information. Stations 1, 9 and 19 responded to a high speed three car MVC on Hampton Street (SC Hwy. 64) near Widgeon Road at 1749 Wednesday afternoon 24-March. According to witnesses, an east bound Ford pickup truck dropped off the right hand shoulder, over corrected and lost control. The truck struck a west bound Ford Fusion head-on before sliding sideways... click here for more information. Congratulations to Firefighter/EMT Chris Elrod for passing his NREMT Paramedic written and practicals. 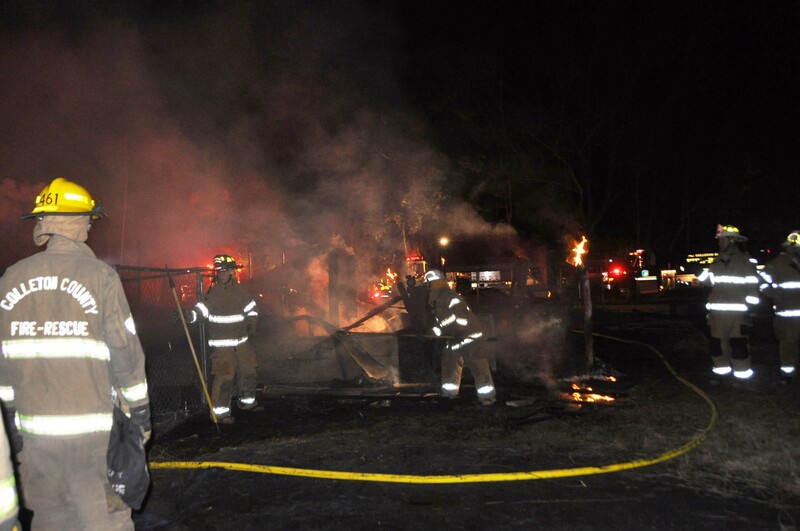 Stations 1, 19, 26 and 27 responded to a structure fire at 1216 Cottageville Highway at 2125, Tuesday evening 23-March. Engine 19 arrived to find fire blowing out of the chimney of the single story brick veneer home. Firefighters searched the interior of the residence, including the attic, but did not find any extension. Click here for more information. We have been notified that DOT is replacing the bridge on Quail Drive near Partridge Trail beginning tomorrow 23-March. The bridge is located at 625 Quail Drive. The road will be closed at the bridge until October 2010. This will affect the primary apparatus and Medic Unit response for the area north of the bridge, which is presently served by Station 26. Communications will be making the necessary changes for all house numbers and intersections with addresses higher than 625 to be handled by Station 19. This will include Partridge Trail and Covey Lane. This is an important response route, so you should plan accordingly when responding to emergencies. We wish to congratulate Station # 9 Captain Dwayne Jacques on his recent promotion. 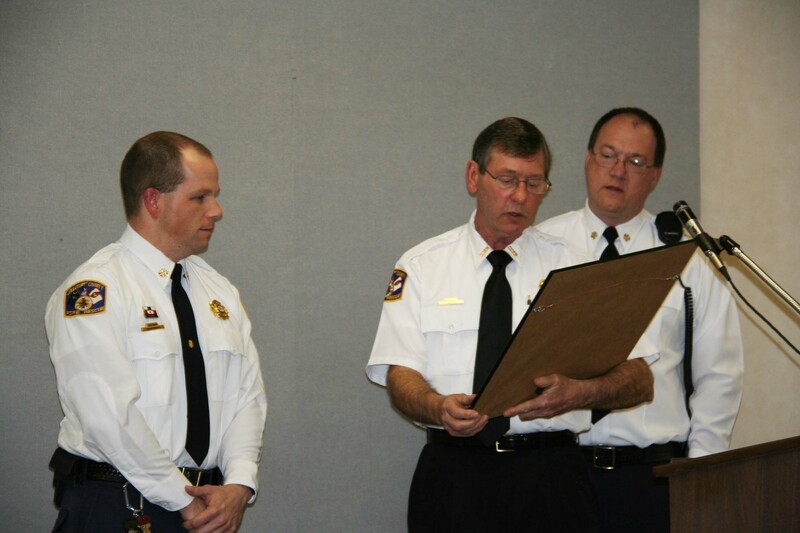 Jacques was promoted to the rank of Captain with his full-time job at the City of Charleston Fire Department. 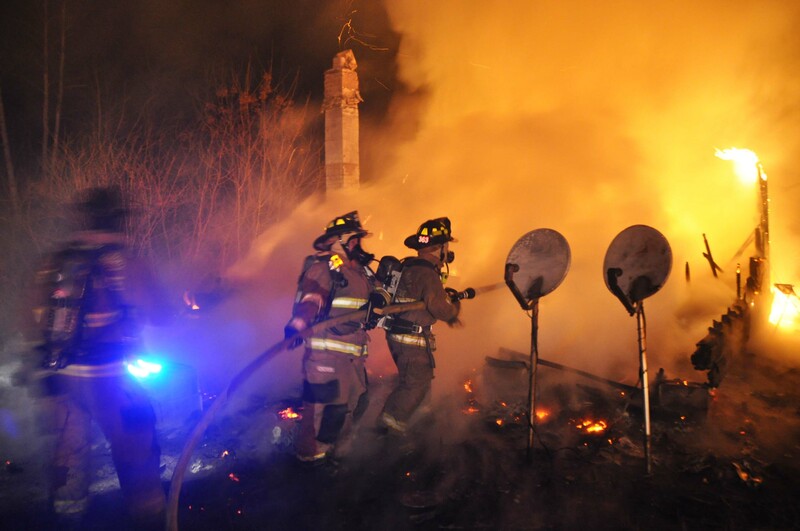 Stations 1, 5, 9, 11, 19 and 26 responded to a structure fire at 1948 Burlington Road at 2222, Friday evening 19-March. 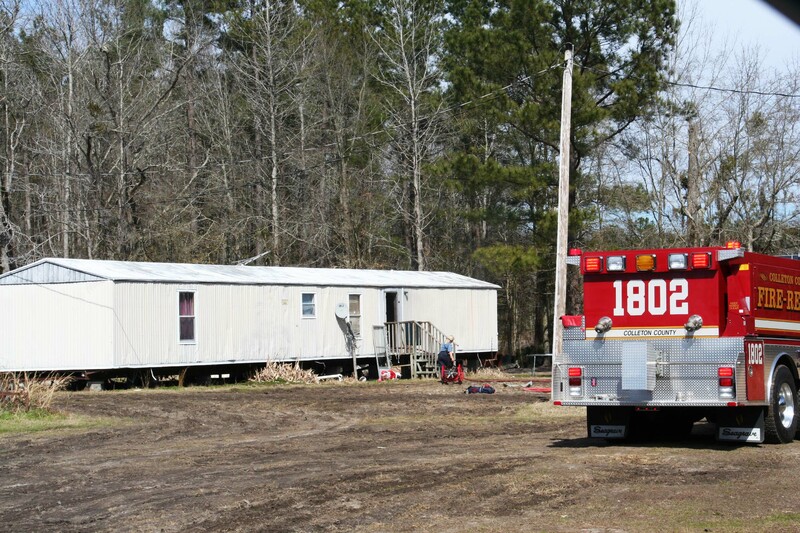 Engine 19 and Medic 19 arrived to find a doublewide mobile home with flames visible through the roof and in the interior of the building. Engine 19 used a deck gun to knock down the flames to permit interior crews to enter the building. Two 1-3/4 handlines were deployed for two interior attacks on the building. Click here for more information. Friday evening 19-March kept units running with a report of an electrical fire in a residence at 955 Southern Charm Road in the Hudson Mill Community at 2021. Stations 4, 7, 18, 26 and Battalion 1 responded. 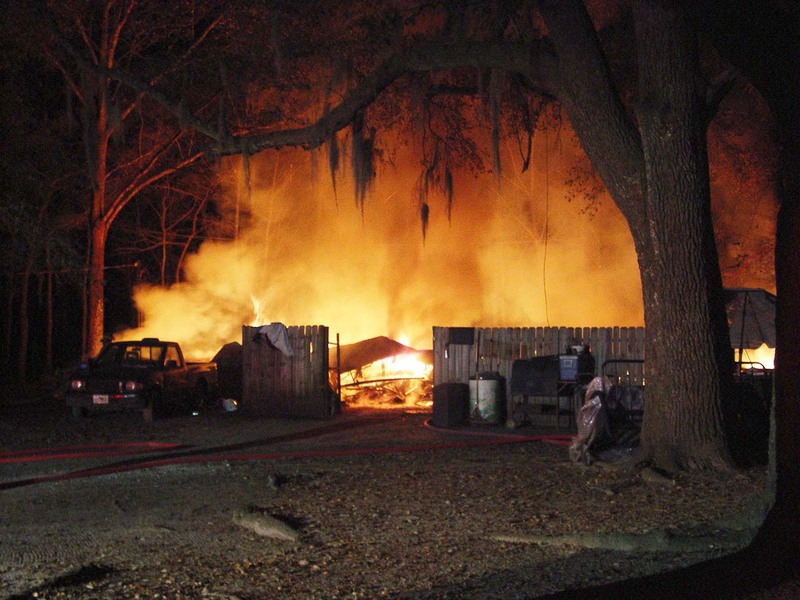 While working to the Southern Charm incident, Stations 2 and 6 were dispatched to a woods fire off of Green Pond Highway near Sid’s Store in the Ritter Community at 2040. Click here for more information. Stations 4, 8, 15, 18, 26 and 27 responded to a structure fire at 1238 Indian Creek Drive at 12:43, Friday afternoon 19-March. Engine 4 arrived 4 minutes later to find heavy smoke showing from the doublewide mobile home with flames visible from the front window of the residence. 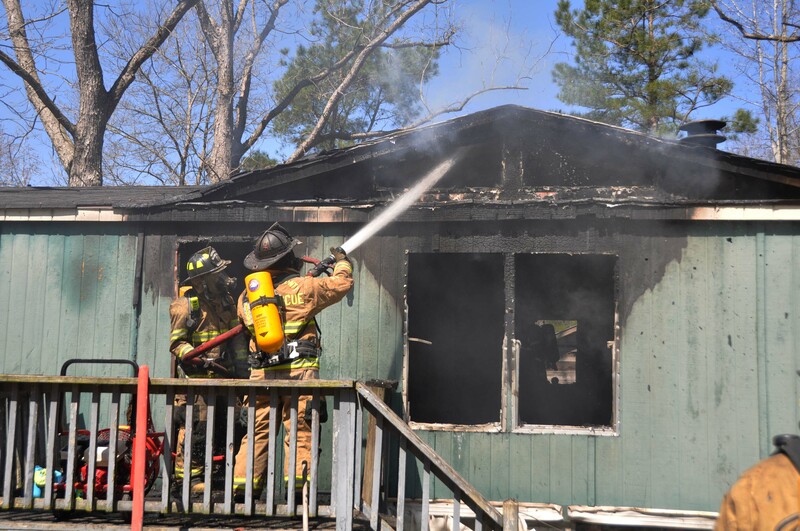 Crews use a deck gun to knock down the flames and deployed two 1-3/4 handlines... click here for more information. All personnel are reminded that the station door code is changing on March 30 & 31, 2010. If the current door code does not work during these days, please utilize the new door code. On April 1, 2010 and after, only the new door code will open Fire-Rescue station doors. If you need the new door code, contact your supervisor. 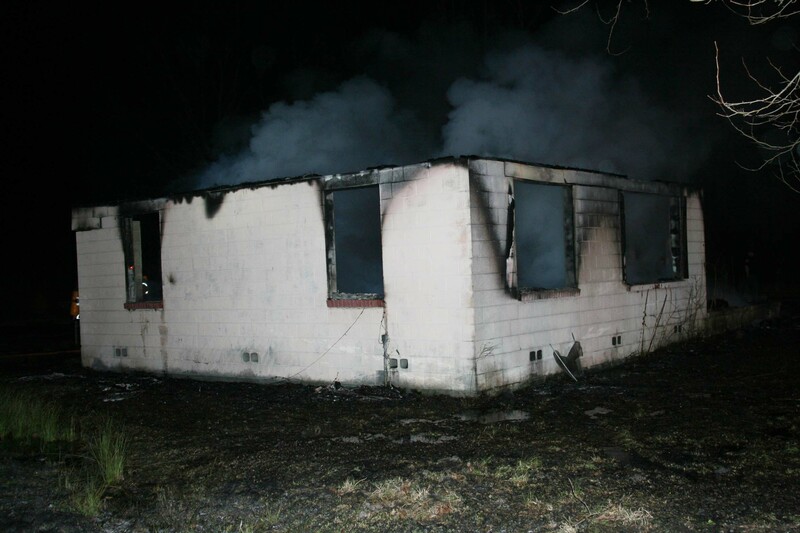 Stations 3, 7, 18 and 23 responded to a structure fire at 16195 Bells Highway at 2126 Tuesday 16-March. Engine 18 and Medic 18 arrived to find an approximately 20 by 40 work shop fully involved with a vehicle also involved. Firefighters deployed multiple handlines to combat the fire. Water supply was handled by Tender shuttle. Click here for more information. Stations 2, 5, 9, 11, 19 and 27 responded to a structure fire at 76 Capricorn Lane Tuesday afternoon 16-March at 1529. The home, which was located down a long narrow driveway off of another long narrow lane was not accessible by fire apparatus. Engine 9 and Medic 9 arrived to find heavy smoke visible from Rambler Way. Click here for more information. 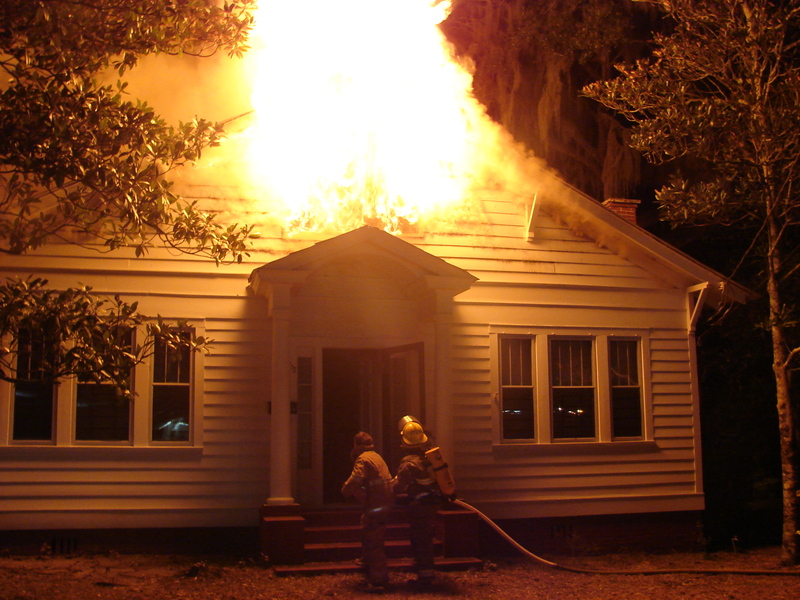 Stations 19 and 27 assisted Walterboro Public Safety with a house fire at 712 Wichman Street at 0114 Tuesday morning 16-March. While on patrol, a Walterboro Police Officer discovered heavy smoke coming from the older one story wood frame structure. Fire units arrived within minutes as flames began venting from the roof at the front and rear of the building. Firefighters deployed multiple handlines from two Engines to combat the fire. Click here for more information. This weekend, March 13 and 14, we will all be setting our clocks to Daylight Saving Time. The time change is a good reminder to change the batteries in your smoke alarms. According to the National Fire Protection Association, more than 66 percent of home fire deaths that occurred between 2003-2006 were in homes without a working smoke alarm. 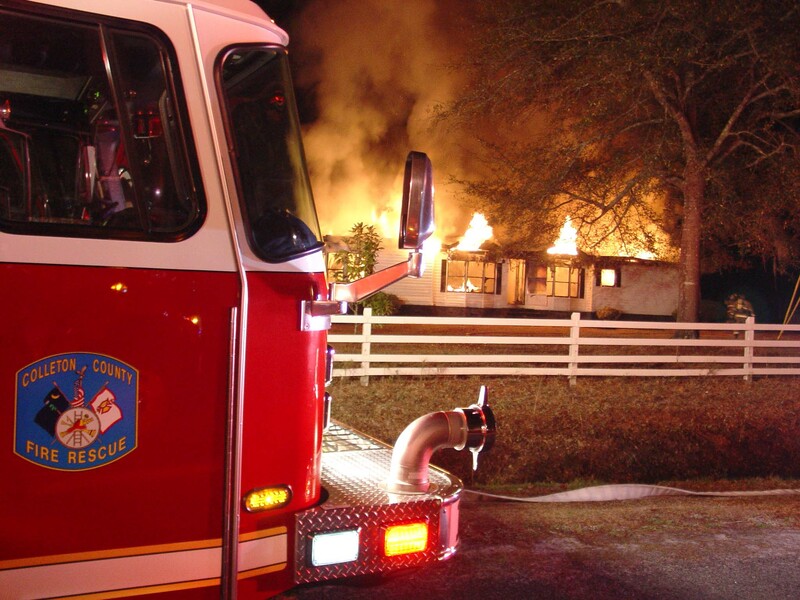 A working smoke alarm significantly increases your chances of surviving a deadly home fire. Remember: Change Your Clock, Change Your Battery. Fire-Rescue participated along with many other agencies at the annual Safe Kids Fair held at the National Guard Armory Friday and Saturday 12 and 13 March. Friday morning all third grade students were bused to the event. Each class of students were able to visit each exhibit. 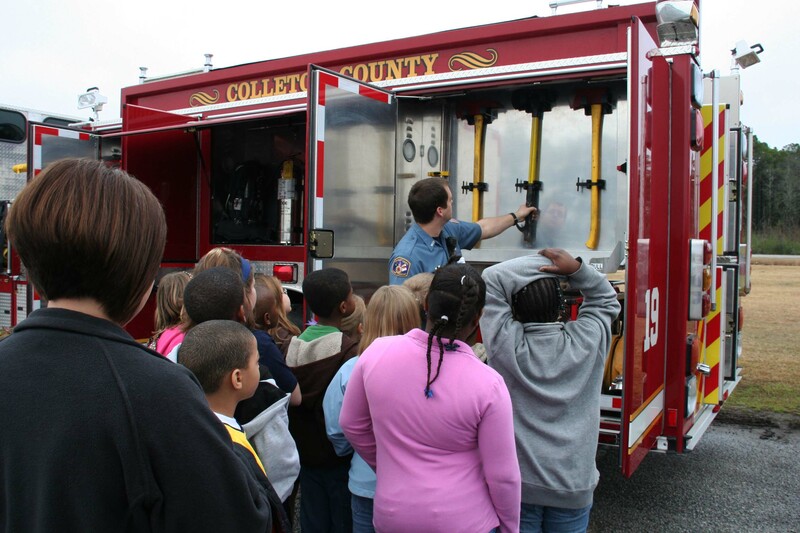 Students learned about school bus safety, gun safety, boater safety, animal safety and electrical safety. Click here for more info. 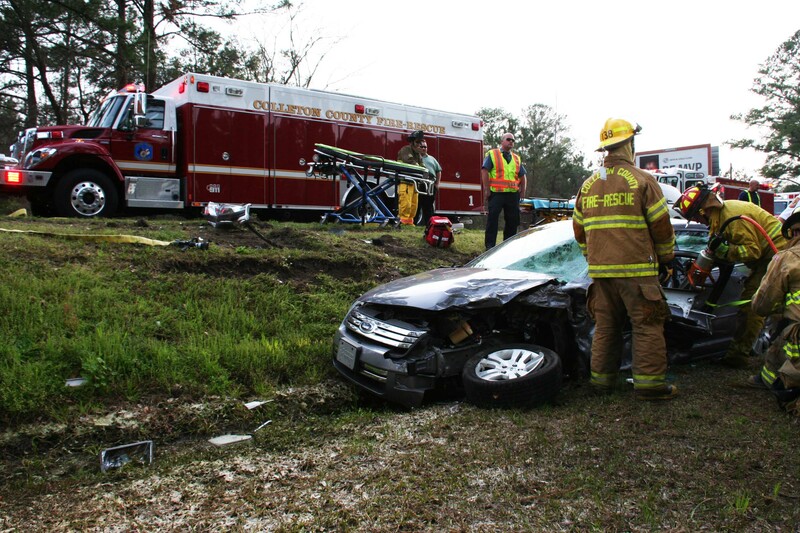 Stations 1, 26 and 27 responded to a two vehicle MVC on McLeod Road at the I-95 interchange Thursday afternoon 11-March at 1552. A Subaru Outback pulled into the path of a west bound Dodge pickup truck and was struck in the driver’s door, causing the small car to flip onto its roof. Both occupants of the outback suffered multiple traumatic injuries. Click here for more information. Congratulations to Firefighter Brian Wilson for obtaining his National Registry EMT-Basic certification. Stations 2, 6 and 21 responded to a structure fire in the 2000 block of Bennetts Point Road Tuesday evening 9-March at 2051. Callers to 9-1-1 reported the house was well involved. On arrival in this remote area, Engine 6 noted the roof had already collapsed on the single story block structure. 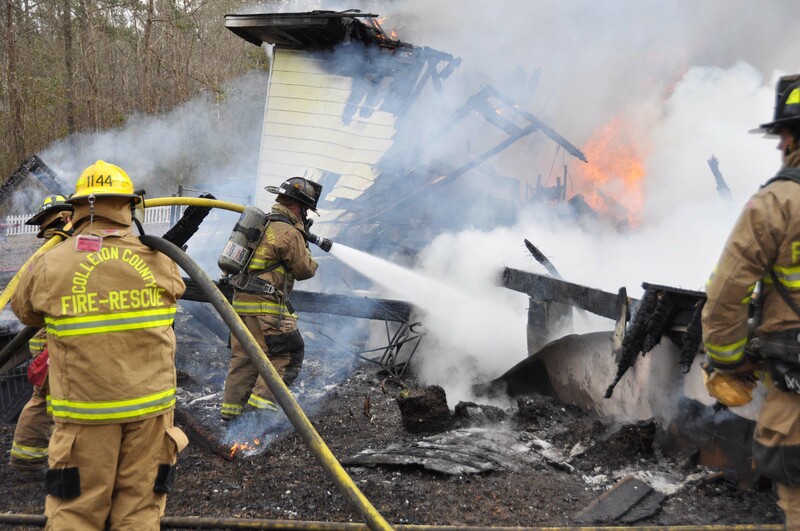 Engine 6 used a deck gun to knock down the heavy flames.... click here for more information. 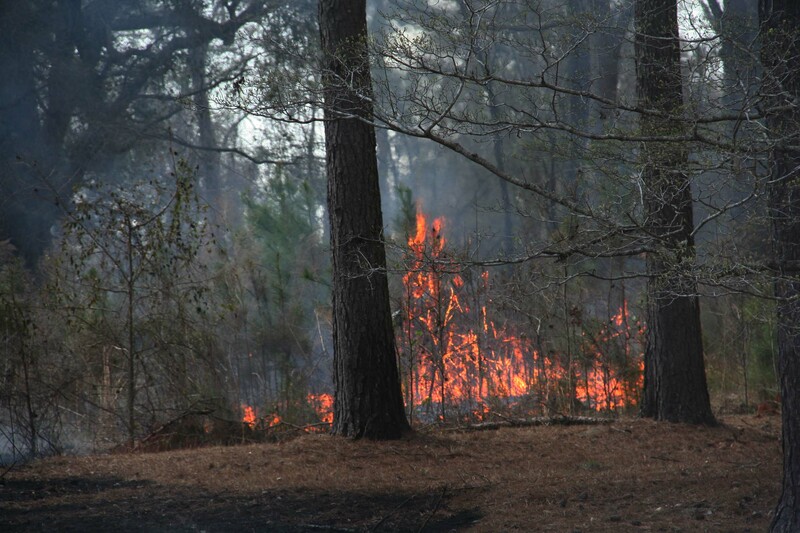 Stations 6, 8, 22 and 25 responded to an approximately 200 acre woods fire in the large wooded area between the White Hall, Clover Hill and Pynes Communities on Tuesday, 9-March at 1546. The fire which may have been intentionally set had several points of origins. High winds quickly carried the flames in a northerly direction endangering multiple homes... click here for more information. Stations 1, 19 and 27 responded to a three vehicle MVC at the intersection of Cottageville Hwy. (US Hwy. 17-A) and Sidneys Road Tuesday afternoon 9-March at 1523. Two vehicles were in the intersection with the third small SUV off the road on the opposite side of the street in some trees. One driver received severe multiple traumatic injuries. Click here for more information. Stations 4, 7, 18, 26, and 31 responded to a structure and woods fire at 533 Southern Charm Road Sunday afternoon 7-March at 1321. 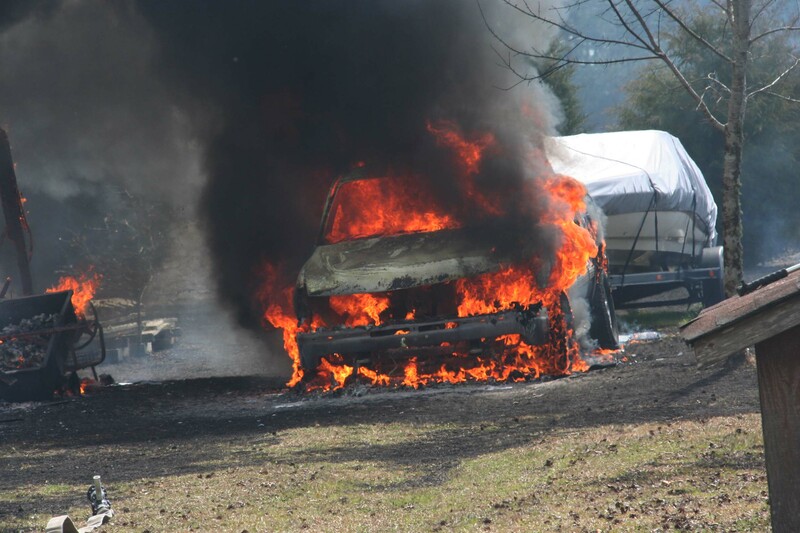 Truck 12 arrived to find a single story work shop and pick-up truck fully involved. A fast moving woods and grass fire was already burning over approximately two acres endangering a doublewide mobile home. Click here for more information. Stations 1 and 9 responded to a single car, high speed MVC on Round O Road near the intersection of Dodds Farm Lane, Sunday morning 7-March at 1004. The driver of the southbound Suzuki reported his steering locked up causing him to leave the roadway in a curve. His vehicle struck several trees causing massive damage to the car. Click here for more information. Congratulations go out to Firefighter/Paramedic Duane Scarborough and his wife Michelle on the birth of their daughter Faith Danielle. Faith was born Saturday 6-March at 1530. She weighed 6 lbs. 4 oz. Both mom and baby are doing fine. 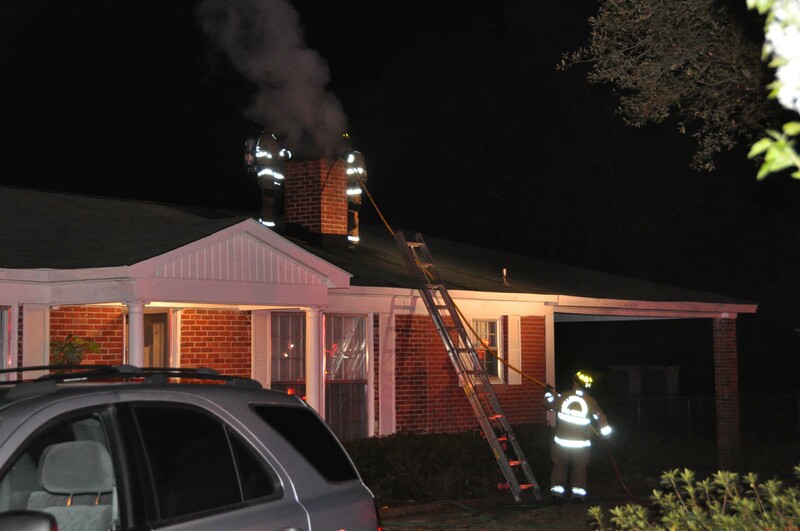 Stations 7, 17, 18, 26 and 27 responded to a house fire at 79 Jordan Lane at 2255, Friday evening 5-March. Engine 7 arrived to find the single story wood frame structure already on the ground. Only one corner of the building was still standing. The fire had extended into an adjacent wooded area north of the building, burned approximately 20 hog pins east of the home... click here for more information. 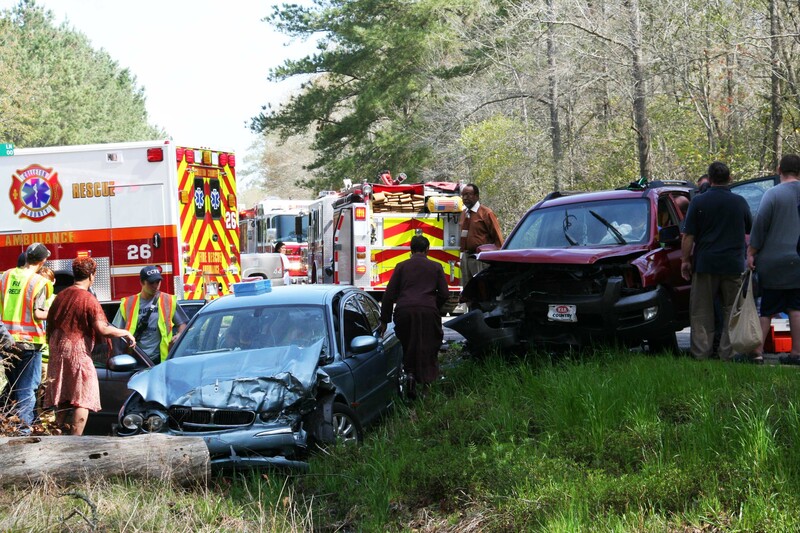 Stations 1, 9, 19 and 26 along with Walterboro Public Safety crews responded to a three vehicle MVC at the intersection of Robertson Blvd and Colleton Loop Friday afternoon, 5-March at 1422. 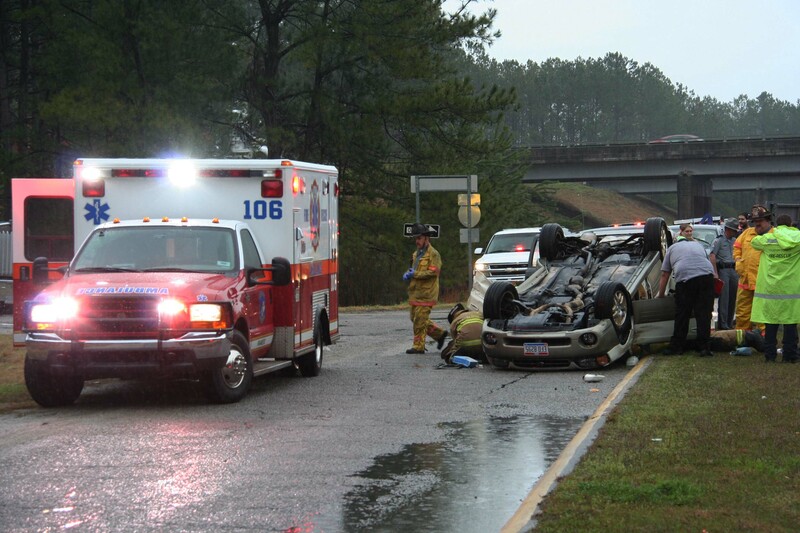 The accident originally had reported entrapment, however that was not the case. 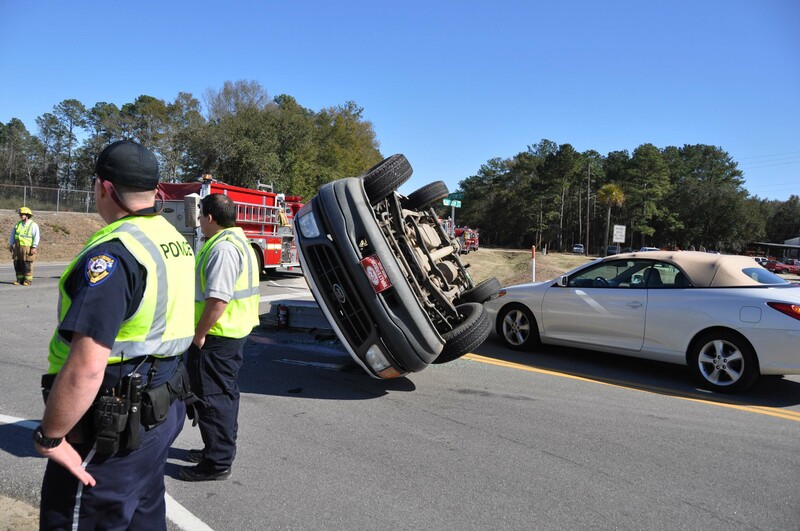 Witnesses noted a pickup truck was struck in the rear end while making a turn onto Colleton Loop... click here for more information. 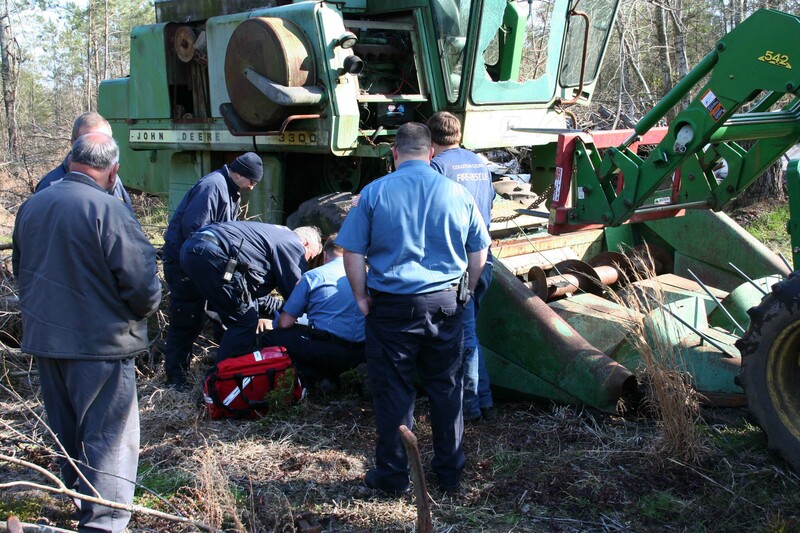 Stations 1, 19 and 27 responded to a man trapped under a corn header (implement attached to a Combine) at 1055 Brittlebank Road at 1535, Thursday 05-March. The man suffered a crushing hand injury, but was extricated by a co-worker using a tractor prior to the arrival of Fire-Rescue. Click here for more information. We are collecting donations for the Colleton County Law Enforcement Memorial Fund to be given on the behalf of our department. Our goal is to raise at least $500 for this worthy cause. If you are interested in donating, please forward the funds to Headquarters before Friday 26-March. If you wish to write a check, please make the check out to the Colleton County Law Enforcement Memorial Fund and we will send all of the funds together. Donations can be mailed to HQ at 113 Mable T. Willis Blvd., Walterboro, SC 29488. If you have any questions, contact Headquarters at 539-1960. The Fire-Rescue Commission was notified by the National Fire Academy that Assistant Chief David Greene successfully completed the four year Executive Fire Officer Program. The program requires attendance to the NFA for two weeks each year followed by a six month research project. Each project was community specific and related to actual issues facing Colleton County. Click here for more information. Stations 1, 26 and 27 responded to a high speed single vehicle MVA on I-95 at the 63 mile marker southbound, Tuesday morning 2-March at 0918. 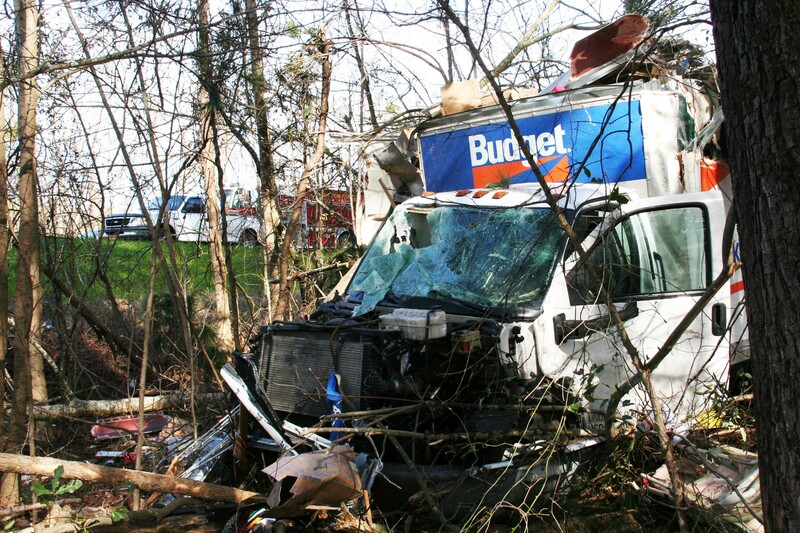 A southbound Budget box-type truck left the roadway and entered the median striking multiple trees. The truck received heavy damage. 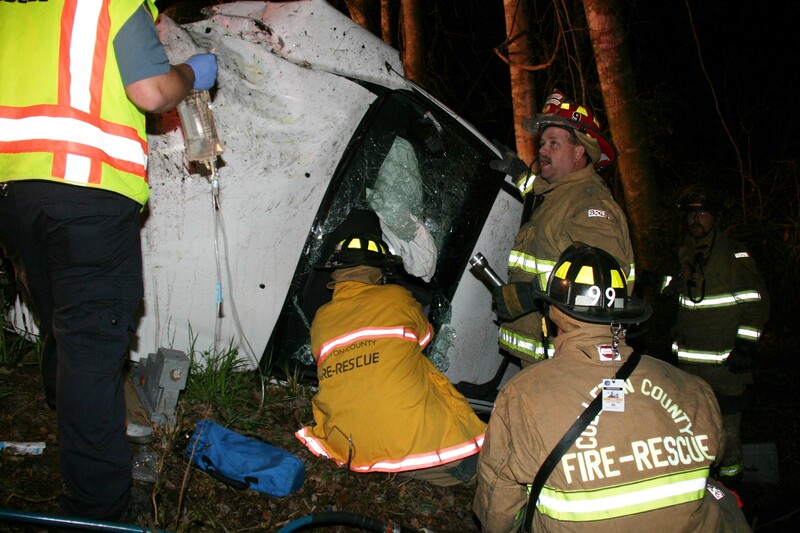 The initial callers reported the passenger was trapped in the wreckage, however firefighter-paramedics were able to extricate the man without the use of hydraulic tools. Click here for more information. Stations 3, 15, 18 and 23 responded to a structure fire at 103 Treasure Court Monday 1-March at 1350. The caller advised that she saw smoke coming from a bedroom, so she exited the building. Engine 18, Tender 18 and Medic 18 arrived to find heavy black smoke coming from the front door of the singlewide mobile home. Crews entered the building with one 1-3/4 handline and a thermal imager, quickly locating the fire in a back bedroom. Click here for more information.